Alison Neville in her studio, working on a piece for the Rio Gallery exhibit on the transcontinental railroad. Photo by Walker D’Agostini. 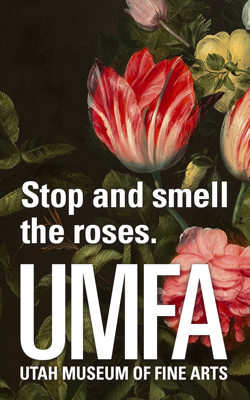 There’s a common rule in the contemporary art world — go big, or go very, very small. Alison Neville chose the latter. From miniature dioramas that fit into sardine cans to tiny polymer mushrooms, Neville’s work is small in scale but rich in depth. Her art is a combination of found object, sculpture, and painting not tied to any particular medium. 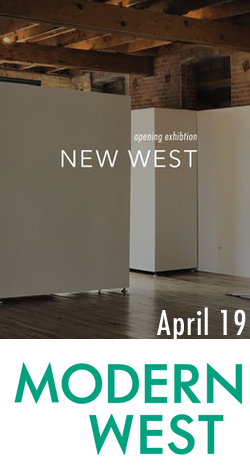 The main themes in her work deal with political and environmental responsibility, war- and industry-torn landscapes, and, above all, the complex relationships of fungi and animals. 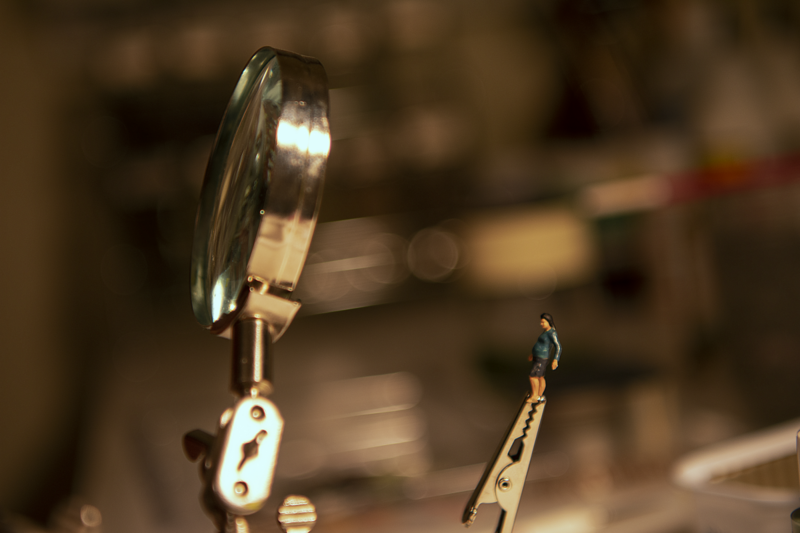 Neville’s tendency to work small means magnification is sometimes necessary, photo by Walker D’Agostini. 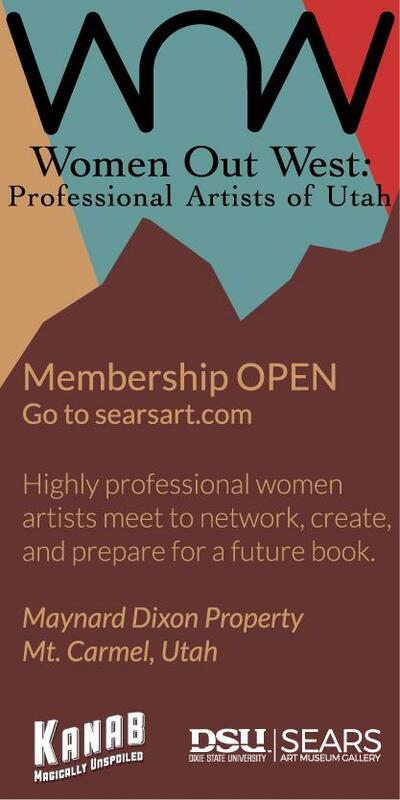 She returned to Utah and later completed her BFA at Weber State University, an experience she loved. 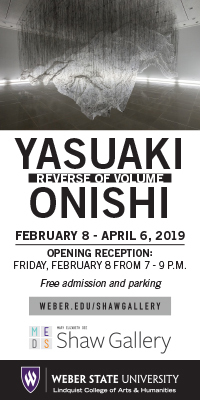 It wasn’t until her university years that she explored more with other mediums, branching out from painting and drawing into found object and sculpture.“I feel like the faculty was very open to me exploring other media than just painting. I felt a lot of support in figuring out my interests and voice,” she says. Neville now works as the educational director at the Bountiful Davis Art Center, leading tours and workshops as well as continuing to produce her own artwork. Neville’s fascination with mushrooms is evident in this piece where the fungi dwarf the animals in the piece. At Weber, Neville was affectionately known as the “Mushroom Lady”. She has built a unique sort of symbolism around fungi and the varied parts they play in our lives: psychedelics, video-game characters, poisons, parasites, food, and symbols of rebirth. 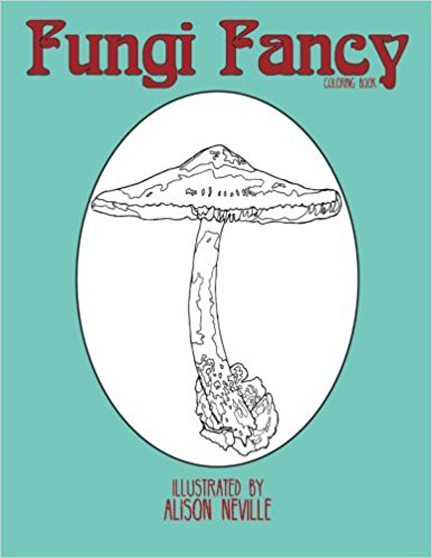 At Weber she was known for drawing images of fungi, especially the Amanita Muscaria (also known as the Fly Amanita), the trademark red-capped mushroom from the Mario games. “The Amanita Muscaria was the first mushroom I ever drew,” Neville explains. “I was on vacation up in the Uintas and found this beautiful hand-drawn mushroom identification guide. We were staying in a cabin without any TV or internet, so the only thing to do was read.” Fascinated by the graceful lines and vibrant colors, she duplicated the guidebook’s drawing of the fly amanita. Then, flipping through the guidebook, she became interested in the various types of fungi and the different reactions she had to them. Each person, she says, also has a personal connection and meaning associated with these organisms. Fungi played a couple different roles in the exhibition. First and foremost was the image of the mushroom cloud and of how devastating the beginning of the Cold War was on the global psyche. Second, mushrooms are incredibly resilient and powerful feeders — they can process heavy metals, clean up oil spills, help counteract global warming, and even soak up radiation. Though it’s never been tested at large scale, theoretically a nuclear testing site could be cleansed by planting certain types of fungi and then scraping them up once they have absorbed the heavy metals. The mushroom, comments Neville, is an underutilized natural wonder. “Some are hideous, terrifying, others more beautiful than even the prettiest rose. In prehistoric times, there were fungi taller than trees. In a very primal way, fungi have a deep connection to the Earth,” she says. A work from the Kitsch Cordyceps series. Part of Neville’s interest in fungi is the similarity between fungi and animals. They shared a common ancestor just 1.1 billion years ago, making mushrooms and humans much more closely related than humans and plants. Both groups are heterotrophic, meaning they consume other organisms for energy, unlike plants that produce their own. “They eat trees the same way we would eat a cheeseburger,” Neville quips. We have similar cell structures which is why it can be so difficult for our bodies to recognize fungi as an invasive threat and eradicate harmful growth. For this reason, medications meant to counteract fungal infections often can harm healthy human cells. Parasitic, intrusive fungi often have skimmed the edges of human consciousness, inspiring popular video games like “The Last of Us,” which explores the Cordyceps mushroom and its potential to turn the human race into zombies. In the actual world, cordyceps fungi infect insects, keeping their host alive but controlling their body to do what is more beneficial for the fungi. 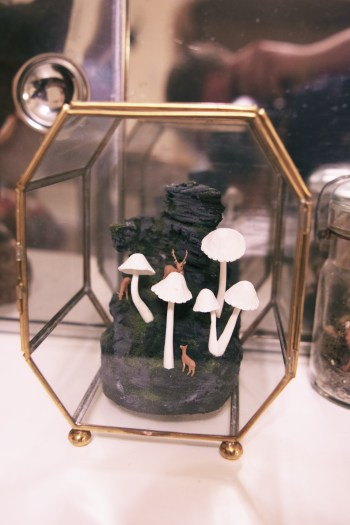 “It’s a strange relationship that [seemed] absolutely perfect on something kitschy and dead-eyed,” she says, referring to her Kitsch Cordyceps sculptures. 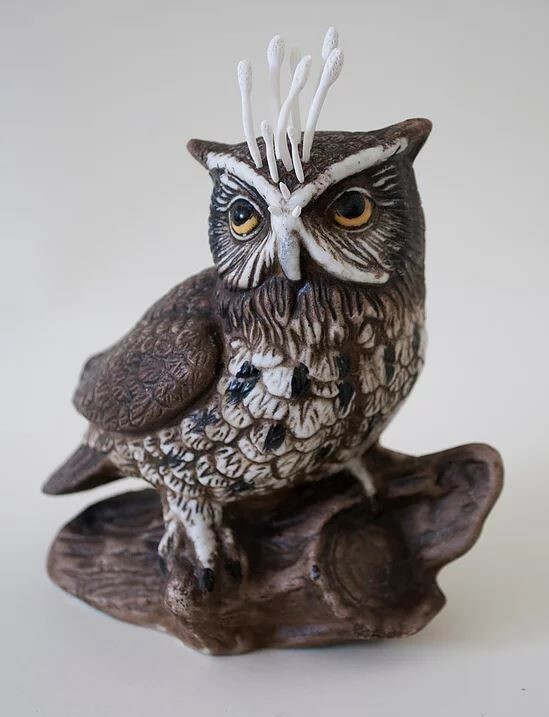 Neville searches out cutified animal sculptures, often at consignment stores, and transforms them using felt or clay. Along with being an interesting take on American kitsch, her pieces also speak to the tendency we have to take nature and make it cute, glassy, and still, so we can enjoy our own form of it. 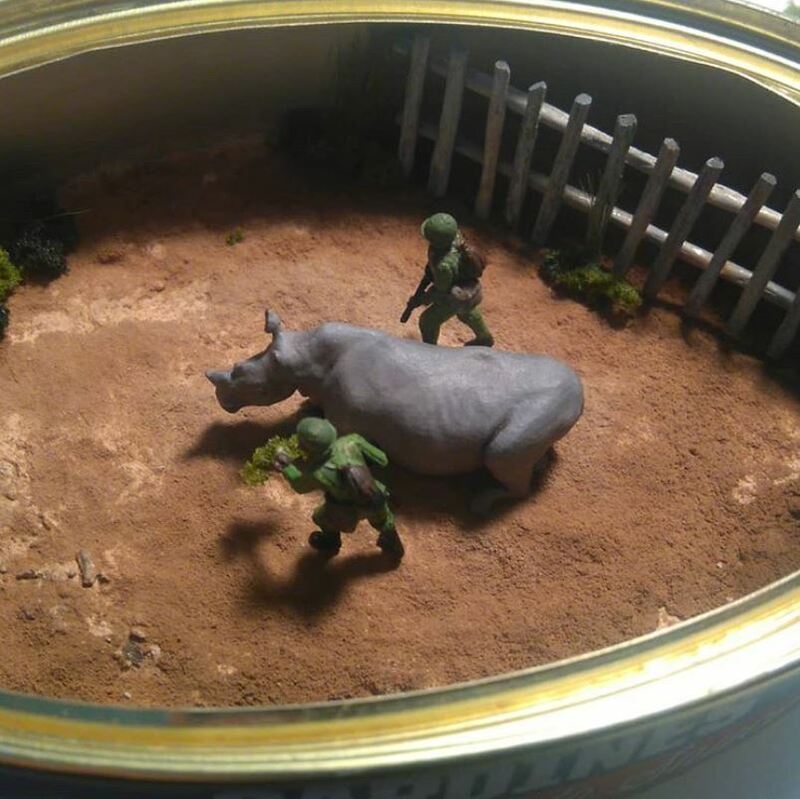 Sudan the rhinoceros is the inspiration for this diorama piece. 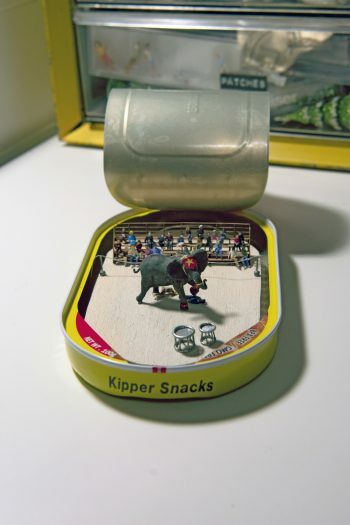 Neville uses a tin of canned herring for this work inspired by the circus elephant Tyke. Most of Neville’s work is politically heavy and, she says, often dark and pessimistic. To alleviate some of the gloom, Neville also creates coloring books, two of which are completed: the Fungi Fancy Coloring Book and Sacred Sloths. “My grandma always used to complain that my drawings were never ‘complete’ because I didn’t color them. They were line drawings,” she says with a laugh. “So I decided to make coloring books so that other people could color my images for me.” Sacred Sloths especially felt light-hearted to Neville, a whimsical take on different religious iconography. Though she doesn’t yet know the subject matter of her next coloring book, she plans to continue them as a break from her more emotionally intense pieces. 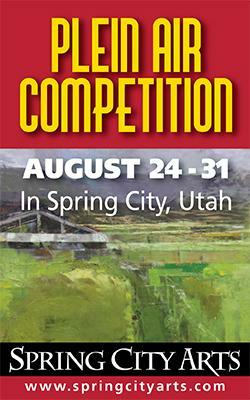 Another of her current projects is “Blood Ties,” a piece for the Transcontinental Railroad show at the Rio Gallery. 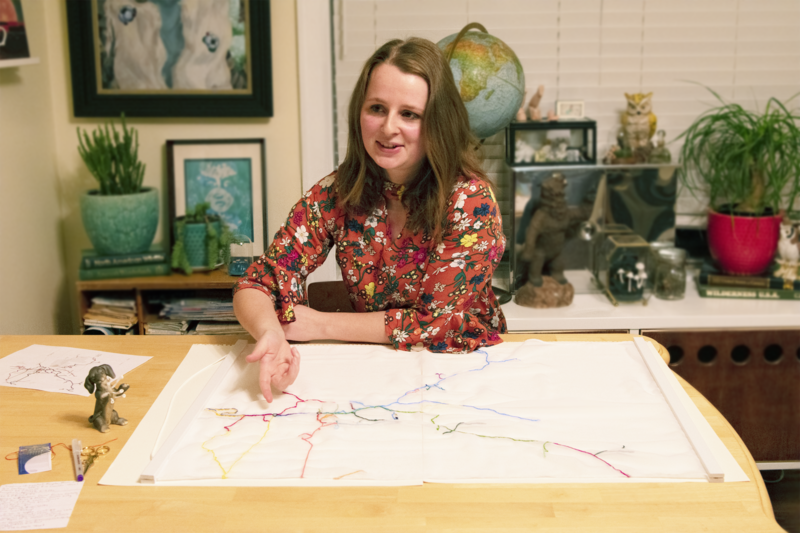 “I originally wanted to do a piece about the ecological impact of building the railroad: how many buffalo were killed, how many towns were built up and abandoned … but there just weren’t enough credible sources from that time to measure it,” she says. Instead, Neville noticed the veinlike structure of the railroad and became interested in translating that shape to a new surface. She chose embroidery on a piece of synthetic silk chiffon in recognition of the many Chinese immigrants who came to build the railroad. “[Building the railroad] was such a male project — men dominated engineering and building during that time. 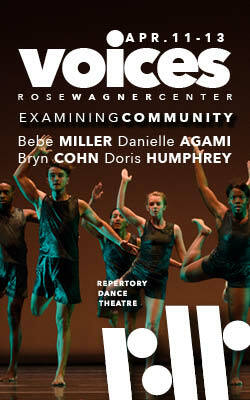 I wanted to use embroidery because it was something my mom taught me, an art form associated with women,” she explains. Embroidery is also a nod to Utah’s pioneer heritage and the many embroidered pieces that can be seen in historic buildings and grandmother’s houses alike. 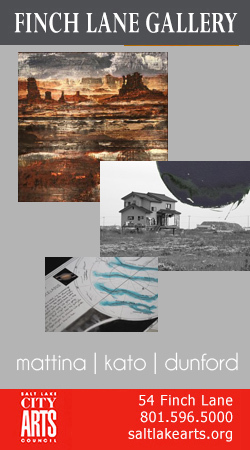 Reciprocity mixed-media work by Alison Neville, Eccles Gallery Center for Arts & Media, Salt Lake Community College, South City Campus, Salt Lake City, March 22nd – May 9. 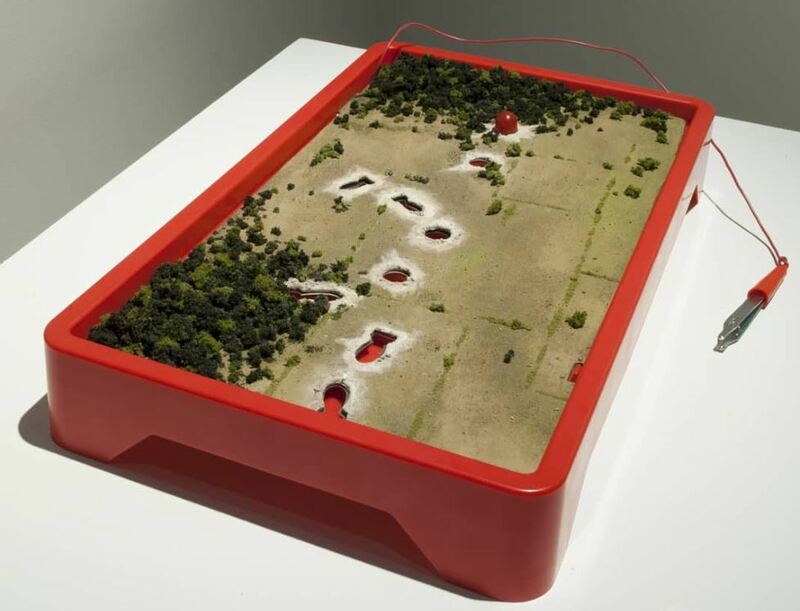 Diorama workshop with Alison Neville on April 4, 6:30 p.m., Conference Room 110, Center for Arts & Media. 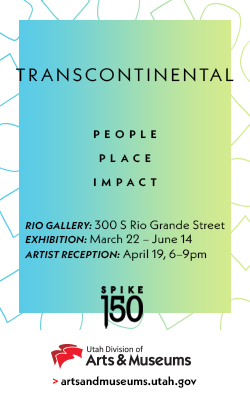 Neville’s work also can be seen in Transcontinental Railroad 150th Anniversary: People. Place. Impact. 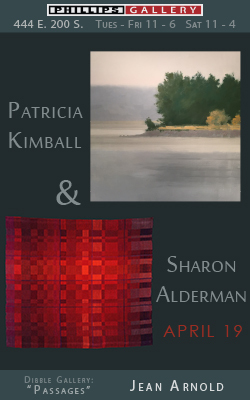 Rio Gallery, Salt Lake City, March 22 – June 14, opening reception April 19, 6-9 pm. What a fascinating new artist you’ve found, Hannah. 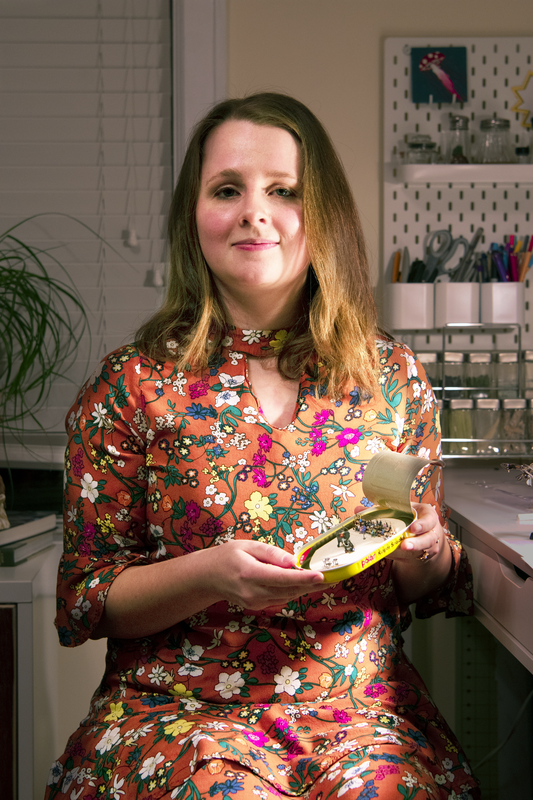 I’ve worked in miniature and love miniature arts from all over the world, starting with Persian paintings and extending to Renaissance enamel portraits and beyond. Some of my happiest hours have been spent hunting for (and eating) mushrooms. I particularly enjoy having a homeowner run out into their front yard and urge me not to eat the mushrooms growing there: “Don’t eat those, they’re poisonous! Toadstools!” When I explain that they’re actually not only edible, but delicious, they suddenly stop telling and start asking. Hiking gained a new dimension for me when I began to spot and track slime molds, which I often find in Utah, moving across the trail. I’m going to check out Alison Neville and her combination of serious gravitas and antic playfulness. That’s as close to a definition of art as I can imagine.